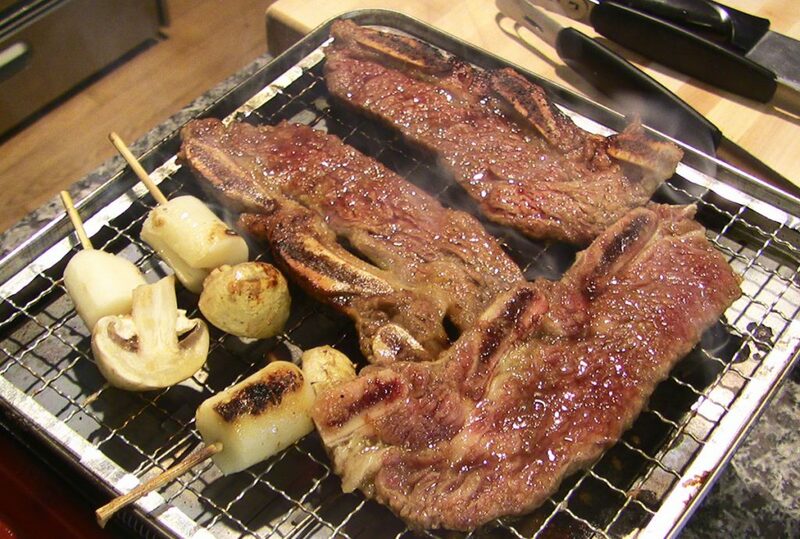 Galbi or grilled ribs is a type of gui (grilled dish) in Korean cuisine. 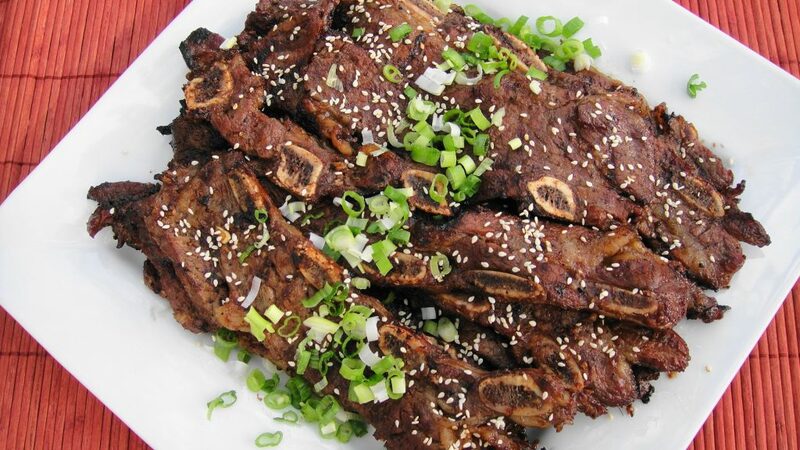 “Galbi” is the Korean word for “rib”, and the dish is usually made with beef short ribs. When pork spareribs or another meat is used instead, the dish is named accordingly. Galbi is served raw, then cooked on tabletop grills usually by the diners themselves. The dish may be marinated in a sweet and savory sauce usually containing soy sauce, garlic, and sugar. Both non-marinated and marinated galbi are often featured in Korean barbecue. Traditionally, galbi is cut to expose one smooth bone along the short edge with the meat uniformly filleted in flat layers. Galbi is grilled, typically by the diners themselves, on grills set in the tables. The meat cooks for a short time on medium high heat on a lightly greased gridiron over glowing charcoal. 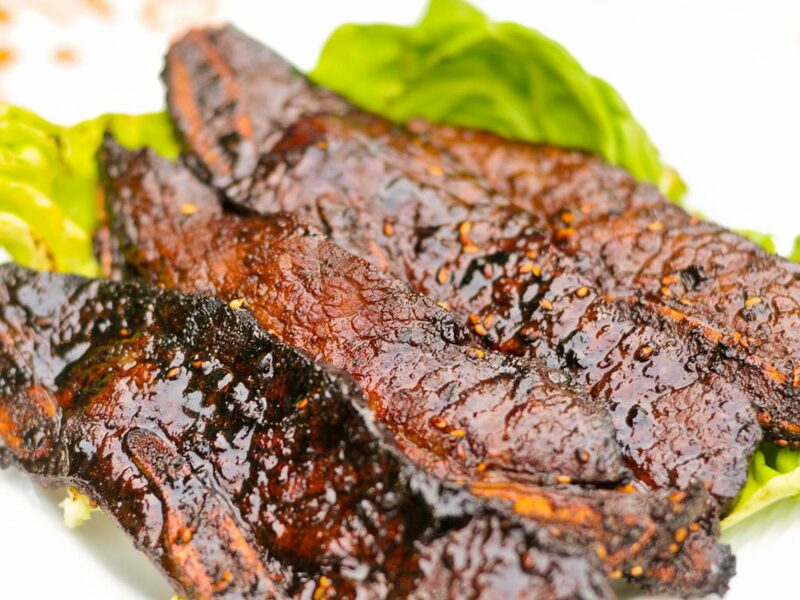 The remaining marinade is brushed on during grilling to produce a glazed finish. Once cooked, the meat is typically cut into pieces over the grill with kitchen scissors, then wrapped inside lettuce leaves, kkaennip (perilla leaves), or other leafy vegetables. These made-on-the-spot leaf wraps, called ssam, usually include a piece of grilled meat, ssamjang, raw or grilled garlic, and a sauce made of soybean paste and chili paste. Like other Korean main dishes, galbi is often accompanied by bap (cooked rice) and side dishes known as banchan. I want to make this recipe for Junglee Maas, but there is one spice i need help identifying. Anyone with good vegetarian InstaPot recipes? Join our newsletter to get notified on new posts!